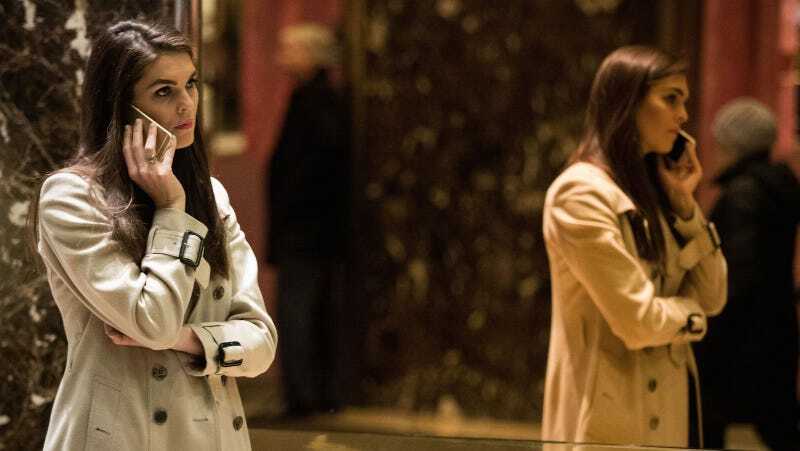 Senior communications adviser Hope Hicks, who is best known as a woman who barely talks in public, may soon be taking on the role of White House communications director, following the ousting of the extremely vocal Anthony Scaramucci. CNN reports that, according to three different sources, Hicks’s new job will probably be announced soon, as negotiations are in the “final stages.” But another source had told CNN earlier this month that the position would go to Stephen Miller as a second gig to pair with his advisor role. Fewer people doing more jobs in the White House could be more efficient, I guess, though hiring a woman in the Trump administration seems to be cheaper. Hicks has certainly gained the least negative attention for her work, and has been with for the Trump organization long before he started leaving greasy orange fingerprints on the White House walls. She’s also not in a dude fight power struggle over the best way to destroy the American public. Hard to know what’s really going on with her when she isn’t even willing to conduct an interview, but if Hicks becomes the next White House communications director we’ll soon find out. Can she top the Mooch?